Gather red, black, and white Premo polymer clay. Make a basic Skinner Blend Bullseye Cane/Plug in Red and White. You will need approximately 1/2 bar of each white and red to make this cane. Cut two slices off of this cane. Place the slices side by side. 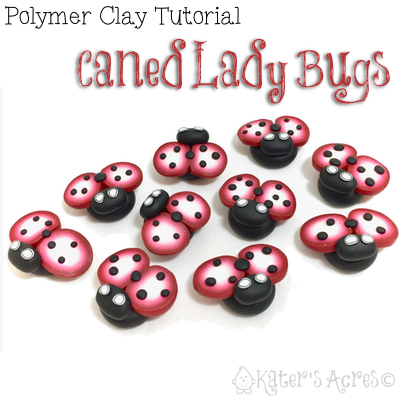 Decorate with tiny black dots of polymer clay (as many as you choose). Be sure that one dot secures the two slices together to help hold them in place. Use a black round and place the wings on the black round. Be sure to leave part of the black showing. Make a small oval with black clay and overlap it in part onto the wings. This helps hold the wings in place and makes them more stable as well as adds strength. Add two small eyes (I chose to use white canes rimmed in black). You can also use seed beads. Repeat this simple design as many times as you would like, in any size that you would like. Bake in your polymer clay dedicated oven for 45 minutes at 275 degrees.